The agent of Ajax youngster Frenkie de Jong has said that he cannot confirm if there are official transfer interests in his client. 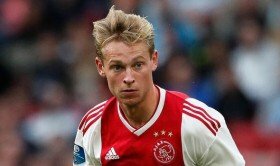 De Jong has been linked with some of the big clubs in Europe including Bayern Munich, Barcelona, Manchester City, Manchester United, Tottenham Hotspur and Real Madrid. His agent said that only the Dutch giants' director of football, Marc Overmars can confirm any contacts regarding the 21-year-old. With a variety of Europe's top clubs after the player, his valuation has been increasing, and it is currently at £72m. With the Holland international still having much of the season to show his skills, a consistent and improved performance will only make the eventual price tag next summer very high. He has appeared six times in the Eredivisie this season.